Long before statehood, North Dakota was home to a number of Native American tribes dating back to 9500 BCE. These early inhabitants hunted mammoths and bison in the North Dakotan plains, and lived along rivers and in woodlands. The Mandan tribe was especially developed in trade and agriculture. In 1682 North Dakota and the land surrounding the Mississippi River were claimed by LaSalle for France. La Vérendrye was the first European to encounter North Dakota and the Mandan people in 1738. More European expeditions to the area, trade with the Mandans and fur posts began to emerge in the years that followed. 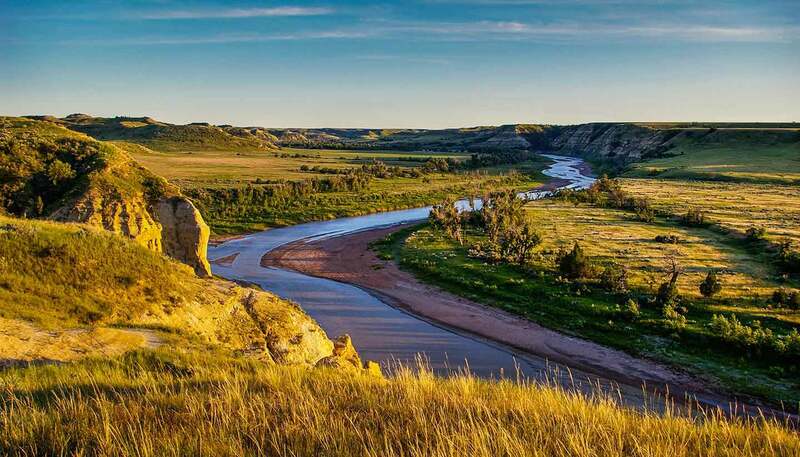 In 1803 North Dakota became a US Territory when France sold the land to the USA in the Louisiana Purchase. North Dakota was part of the Minnesota and Nebraska Territories until 1861 when it became the Dakota Territory, including South Dakota. 28 years later the land was divided into two separate states. Homestead initiatives in North Dakota were attractive to Americans looking to move west in the 19th century. Many of these migrants were German Americans and Scandinavian Americans. The construction of railroads also increased migration to the once sparsely populated state. From 1878 to 1884 there was a surge of immigration to North Dakota’s Red River Valley because of the railroads and commercial “bonanza” farming. North Dakota is the birthplace of the Nonpartisan League, a political group that emerged from the Republican Party in 1915. The NPL was run by farmers and based its economic platform on agrarianism and state-control. The NPL gained momentum throughout the Midwest and took over North Dakota’s state offices in just one year. In the 1950s the NPL merged with the state Democratic Party. Drought followed by dust and wind storms hit North Dakota and the Midwest in 1929, lasting through the Great Depression in the 1930s, but with the revival of farmland and wheat crops which occurred during WWII agriculture became, and still is, North Dakota’s industry leader employing 24 % of the population, with its economy thriving on flaxseed and canola production. The majority of North Dakotans are Protestant with the greatest affiliations to the Evangelical Lutheran Church and the United Methodist Church. Roman Catholic followed by Muslim and Jewish minorities make up the rest of North Dakota's religiously affiliated population. North Dakota has the most churches per capita in the USA. North Dakotan culture is rooted in influences from Native Americans, Germans and Scandinavians. As with the rest of rural Midwestern USA, North Dakotans are known for sincerity and friendliness. English is the main language spoken throughout North Dakota but the state retains a small minority of residents whose first language is German.